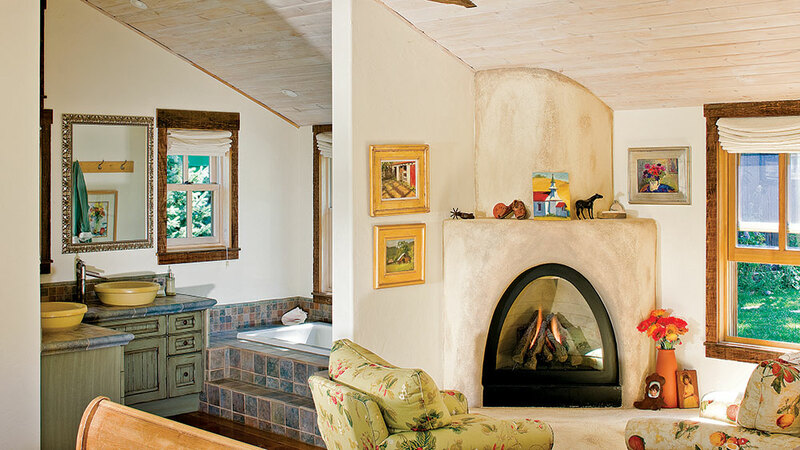 Recycling salvaged materials yields a small Rocky Mountain homestead that fits naturally into its majestic landscape. Buying a property with two old shacks that need to be removed isn’t unusual. But few buyers are willing to tackle the challenge when the local preservation board says the shacks cannot be torn down or moved. Joe and Liz Lecoq Currier were looking to relocate to Colorado from California. In Crested Butte, they found a riverfront lot that they loved, complete with two landmark tin-roofed industrial coal sheds that had scared away potential buyers. Incorporating two 19th century relics into a livable home didn’t faze Liz and Joe. Where others saw obstacles to creating their dream home, they saw an opportunity to build a home that fit naturally into its surroundings. Joe called Mike Fahrlander, a local builder. “We were hoping with Mike’s reputation for tackling projects no one else would touch and his unshakable preservation-first philosophy, he would be interested in helping us,” says Liz. Fahrlander understood the property’s magical quality immediately, and signed on for the project. While he stabilized the sheds, Liz and Joe interviewed architects. What Liz hadn’t envisioned, however, was that the building process would include nearly three years of painstaking phone calls and meetings with the town’s preservation board. The modest-sized house Liz and Joe wanted to build had to meet stringent standards to harmonize with the town’s historic appearance. The delay, it turned out, had its advantages. They used exterior siding cut from weathered barn planks for the façade of the built-from-scratch house. The reclaimed wood was necessary to comply with an architectural compatibility ordinance. Liz and Joe wanted the inside of their home to use the same wood, even though it wasn’t required, so that the interior would also appear to be centuries old. The next step was to find antique timbers, doors, windows and flooring. Liz was amazed by what she found for sale on the Internet. 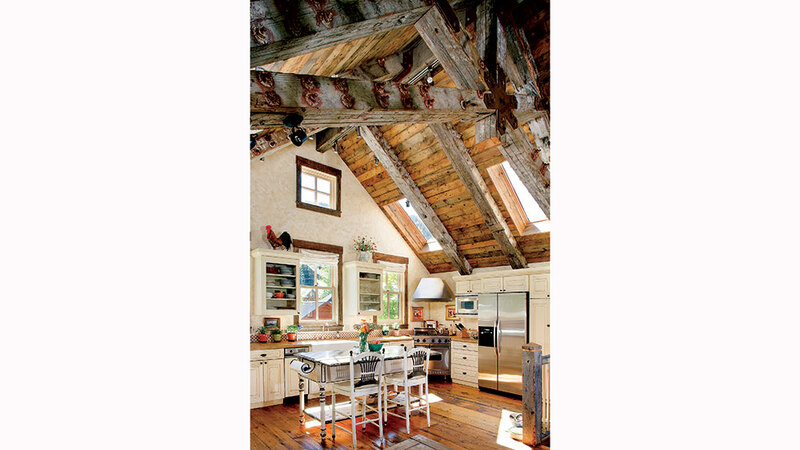 She bought massive posts and beams that had once supported an Oregon warehouse and some 300-year-old eastern heart pine flooring that came from the ruins of a Virginia apple barn. When the planning board rejected a gable-end cathedral window because it was not traditional, Bill suggested substituting several small double hung ones. Later, the board questioned the French doors that Liz wanted between an upstairs living area and a narrow deck, but this time there was no compromising. 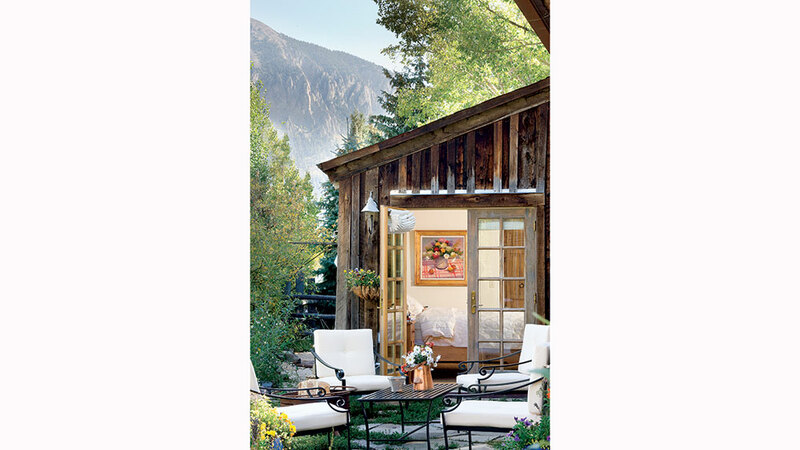 “Clearly, they didn’t have French doors in Crested Butte when it was a mining town, but I truly believed that panels of small glass panes framed with weathered wood would be in keeping with the town’s heritage,” Liz explains. Her argument that the doors were necessary for access to the outdoors was persuasive and the doors were allowed. Using the same argument, they got another set approved for the master bedroom. The doors open onto a small flagstone patio that is the gateway to the natural beauty that surrounds them. Design Firm: Coburn Development Inc. Sitting on a secluded patio listening to the sound of water from Coal Creek, it’s hard to believe that the neighbors’ homes are only a stone’s throw away. French doors were added to the board and batten shed to let the afternoon sun into the couple’s bedroom. 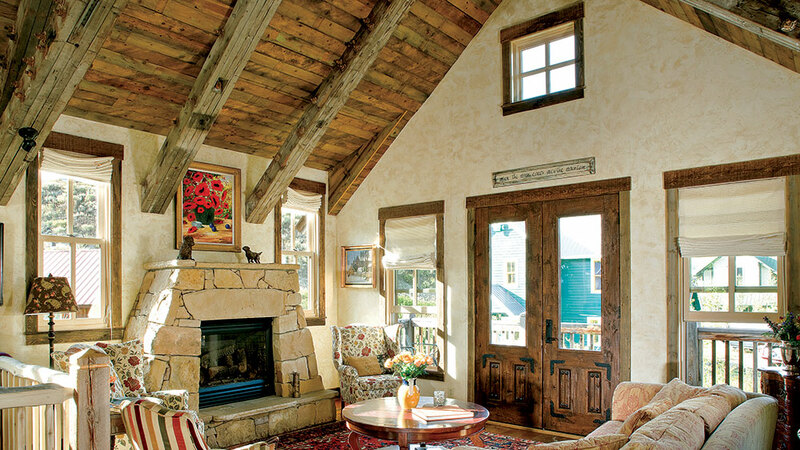 True to Rocky Mountain snow country tradition, the home’s kitchen and main living room are on the top floor. A gas fireplace set into a pyramidal stack of Arizona buff sandstone keeps things cozy even when the snow banks reach the top of the ground floor windows. sensitive smaller openings with skylights. Tucked into a former coal shed’s 480 square feet of usable space, the master suite is roomy enough for a queen-sized maple sleigh bed, a spa area with a stone-faced whirlpool tub and pair of his and her tinted concrete vessel sinks atop faux grained green vanities and a sitting area anchored by a Southwest style gas fireplace. 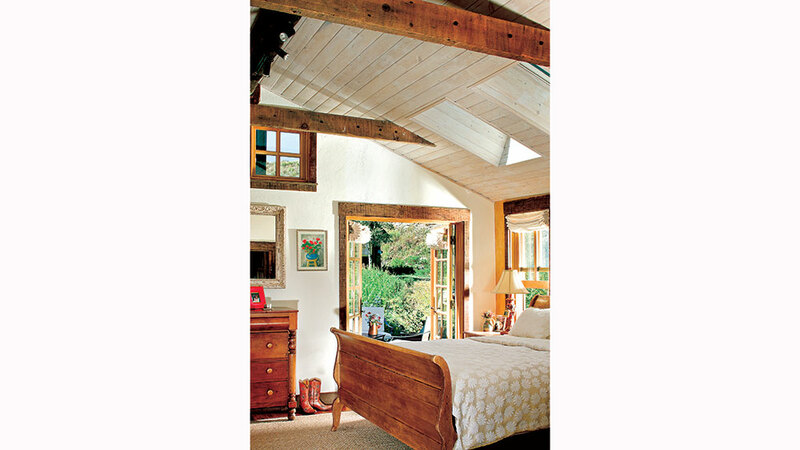 Exposed square cut beams add a feeling of history and stability to the bedroom’s sheetrock interior walls. 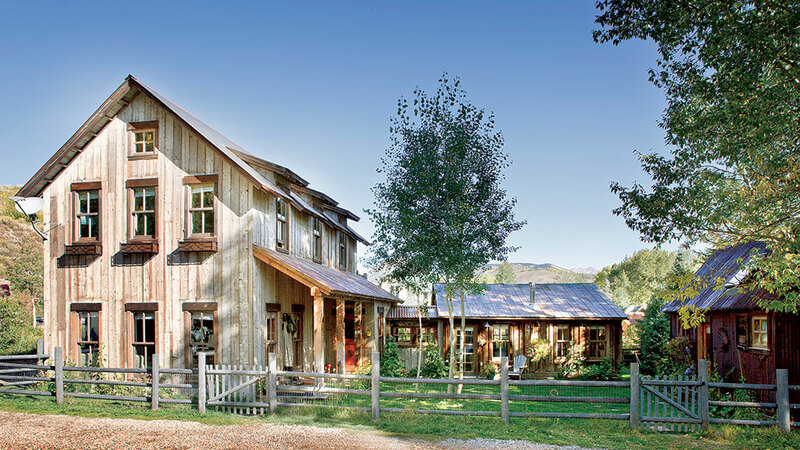 Relying on years of experience rescuing Colorado’s historic structures, builder Mike Fahrlander reconstructed the shed’s original metal roof before insulating and sheathing it with whitewashed western Douglas fir.